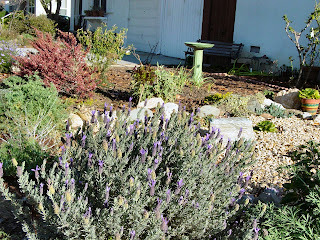 This is a new garden, planted mid-2011. With help from the owner’s neighbor (and best friend), this homeowner tore out the front lawn and parkway. 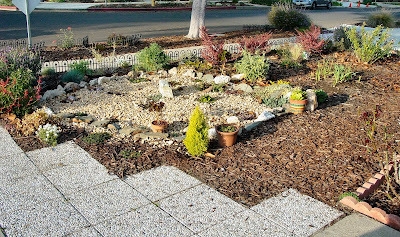 They planted a mix of California natives and Mediterranean plants and installed a large rock garden made up of cacti and succulents, using California Gold gravel as a mulch. Rocks found on the property when digging up the lawn are incorporated into the rock garden. Complementing the new front garden are an existing lemon tree and rose bushes. The owner has grown garlic, zucchini, lettuce, herbs in the front garden as well. They also removed grass in the backyard last spring, planting a large, successful vegetable garden there beside several existing fruit trees. The owner waters by sprinkling with can and hose. When established, the new landscaping will consume even less water. Another $avings is no more gardener. The owner is able to maintain the garden and is learning to keep a natural garden and use organic methods for a healthy soil. The owner finds the new garden very exciting for many reasons. The rock garden is a favorite feature. 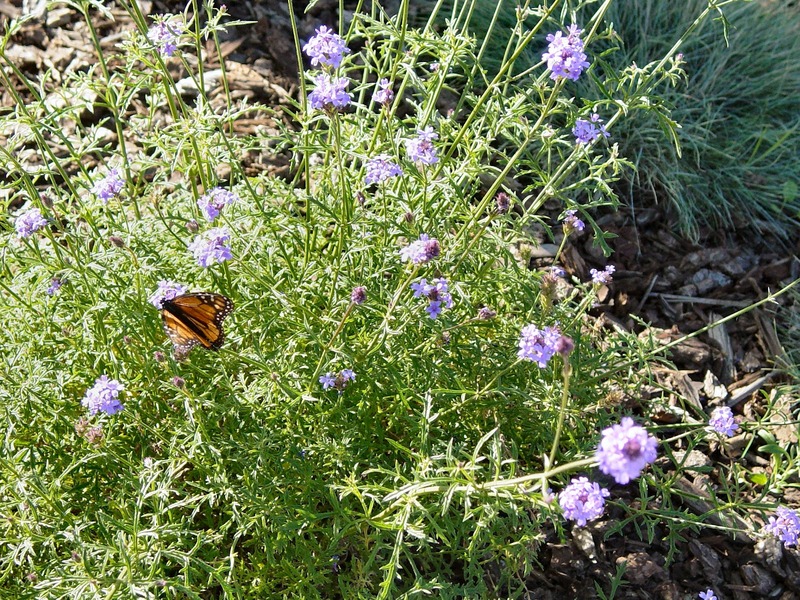 The owner also loves the California natives, such as yarrow, ceonothus, verbena, sages and manzanita. 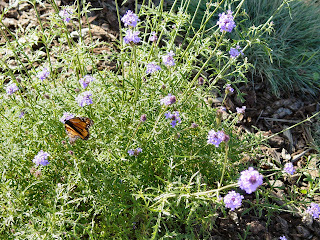 There are butterflies, hummingbirds, bees and worms. But the the very best thing is that now there’s a beautiful, sustainable front garden that attracts wildlife, and the owner can maintain it without any mechanical equipment such as the horendous gas leafblower.